A cold air intake is one of the most popular bolt-ons for the Toyota Tundra and Sequoia with the 5.7 Liter V8. The right cold air intake system can add horsepower, torque, and the highly sought after throaty intake noises. Not to mention the added benefit of improved fuel mileage. However, not all cold air intakes are created equal. For this reason we dug in to identify the best cold air intake systems for the Toyota Tundra / Sequoia 5.7L. S&B Filters are an aftermarket automotive components manufacturer with a difference. They’ve been operating in the US for over 30 years, and have maintained the highest quality by making almost all of their parts in the US, this helps keep costs down too. They don’t only manufacture cold air intakes, but air filters, particle separators and more. Components are further made for a wide variety of manufactures and models. To further ensure quality, all their products are tested to their competitors making use of the ISO 5011 standard. S&B’s air intake is one of the highest rated cold air intakes available. Their claims regularly get supported by customer reviews, majority of which are incredibly impressed with the product. The 75-5039 cold air intake makes use of two main systems to maximize the air inflow. Firstly, they utilize all the available space in the engine bay for the intake. Secondly the intake has two openings to pull air into the box. Culminating in a 54.2% increase in airflow. The second intake even has a plug, allowing you to open or close it as the situation calls for it. S&B don’t only test their parts for improved air inflow, it still has to work as an effective air filter. As such they put their parts through stringent tests supported by their well-funded lab. Focusing on the air filter, they didn’t just include a big filter, they used an inverted top, known as a powerstack, to increase the filter’s capacity. S&B put your experience above everything. High quality is an obsession of theirs, and this leads them to design their kits with a properly mapped air sensor. As vehicles get more complex, it becomes harder for aftermarket companies to keep up, but S&B invest large amounts of time and money to ensure your car works with their products without the need for additional tuning. S&B have even incorporated a bracket into the design to ensure an effortless installation, so that you have the confidence that their product is securely mounted and won’t cause any damage. Another big thing that S&B offer that others don’t is their million-mile warranty. This not only covers the products they manufacture, but they further guarantee that customers will not have to pay as a result of a manufacturer refusing to back up a warranty due to the installation of an S&B air intake. This means you can install this cold air intake on your brand-new Toyota Tundra without worrying that Toyota’s going to block a warranty claim later on. Head on over to their website for more details. If you’re still not convinced, just take a look through their customer reviews, featuring not a single 1-star review, and over 70% 5-star reviews. The product won’t let you down. Although S&B do note that their air filter does not meet CARB standards, this is not unusual for this line of products, and it shouldn’t stop you purchasing the best cold air intake system for the Toyota Tundra 5.7l. Filter manufacturers seem to enjoy the double letter naming convention, as the S&B product is followed up by K&N. With a very similar business model to S&B, K&N manufacture air filters, air intakes, oil filters and various other performance parts for the automotive market. K&N Engineering is based in Riverside CA, and dub themselves the world’s leading manufacturer of washable performance air filters. The company was established in the early 1960s, being heavily involved in the motorcycle racing scene. This pedigree has served them well as they expanded their facilities and operations. Their mission statement includes producing quality products, and they manufacture parts for over 5,000 different vehicles. At first glance the 63-9036 has an odd appearance, with the air filter being completely exposed to the surrounding area, with a limited heat shield to keep the incoming air cool. This lack of enclosure is most certainly by design though, ensuring the air intake is not restricted at all. It also makes an already easy installation, that little bit easier. All you require is a screwdriver, pair of pliers and a ratchet set. Along with the enlarged intake, you are also provided with an oversized washable high-flow filter. It’s the starting point of K&N’s design process, finding the biggest air filter that will fit in the car they’re designing for. The larger the filter, the less air resistance there is on the intake. The larger filter also means it can capture more dust before requiring service, in fact K&N claim up to 100,000 miles before a clean is needed. To help get those last few horsepower extra, K&N don’t stop there, but continue along the system improving on the filter to engine section. In this case, they’ve used a free-flowing, high density polyethylene tube to cut down on friction. To help get an understanding for the kind of performance boost you can expect, K&N test all the systems on a vehicle dynamometer, and the estimated horsepower gain for the K&N 63-9036 is 9.25 HP at 5,497 RPM on the Tundra 5.7l engine. Much like S&B, K&N also offer a million-mile limited warranty, based on their well-engineered products built with the finest materials. K&N also manufacturer a 77-9036KP cold air intake with free flowing-aluminum tube. The product is similarly priced, but boasts a performance improvement 20% less. Neither intake system is CARB approved. At a similar price to the S&B product, the K&N offers a similar product, but maybe not quite as good. Another cold air intake, and another design. Volant are new to the scene when compared to its two-letter competitors, but have still been producing cold air intakes for almost 20 years. One of the unique aspects of this cold air intake, is their trademark design, and that is the idea of a closed-box intake. While other manufacturer’s try to open their filters as much as possible, Volant enclose the filters, although still making use of large intakes, and large filters. Volant don’t provide too much information on their products, or their intended gains, but a performance boost will definitely be present thanks to the large Powercore filters that they use. Majority of the piece is composed of polyethylene, with a filter access cover made out of either aluminum or carbon fiber. Heading onto customer reviews, it is on the whole positive. Those who’ve installed it enjoy the new sound, and added power, with some even claiming improved gas mileage. The one thing bringing it down though is several one star ratings from Tundra owners who’ve had the hose clamp pop off at the connection between the pipe and the intake manifold. It’s nothing that’s going to damage your car, but there are a few too many comments for us to be completely comfortable with the product. It does still manage an above 4-star average customer rating though, but at the same price as other cold air intakes on our list, not our top choice. What’s better than an aftermarket product made by some of the best private companies? A product in the same market, made by the manufacturer themselves. Since you’re looking for a cold air intake system for the Toyota Tundra, we obviously don’t have to explain to you who they are, or anything about their world-renown for reliable cars. With the large Toyota Racing Development logo emblazoned on the top of this cold air intake, it fits in perfectly in the corner of your engine bay. An important thing to note is that this is not a complete set, but makes use of the stock air filter box. Not a problem for most, but if you already have an aftermarket part installed, you may have problems fitting this one. Toyota Racing take their job seriously, and all their products go through rigorous testing, with dynamometer results showing increased horsepower throughout the RPM band. Furthermore, their products get the backing of CARB, an important note for those living in California. Power improvement is achieved via the use of a larger TRD high flow conical air filter, and changes to the intake system, making use of a unique intake flow accelerator. This has the dual function of smoothing and accelerating the airflow into the system. You’re also provided with a custom-calibrated filter service gauge, which lets you know when it’s time to clean your filter. Although it hasn’t received many reviews, the only negative review it has received was someone who was unhappy that it required the original air filter to already be installed. All the other reviews were positive. The only real problem with this product, and it’s a large one, is its price, which is 50% more than its competitors. For those of you in CARB states though, this may well be your best choice. The goal of a cold air intake is to improve the performance of an engine, both in terms of power and torque output as well as fuel efficiency. They are based on the principle that the more oxygen molecules that are present during combustion, the better it is for the engine’s output. They achieve the increase of oxygen molecules in several different ways. They may alter the parts of an air intake to reduce the amount of air resistance. They may remove muffling devices from the intake, providing a more direct route for the airflow, again reducing air resistance. They may also shorten the length of the air intake, and place the intake in a manner that it can make use of the ram-air effect. Some intakes also incorporate heat shields to minimize how much the heat of the engine impacts the air going in. Occasionally even positioning the intake against the fenders, removing it from the engine bay. All of these methods are used to either allow cooler air to enter the engine than otherwise, or to increase the pressure of the air going into the engine. Both of these objectives result in an increased density of air, which means more oxygen in the engine for combustion. Cold air intake systems can be manufactured from a variety of materials; everything from metal, plastic and rubber to composites like carbon-fiber and fiberglass are used. Installing such a system can lead to a number of consequences. Firstly, the engine intake noise can be significantly affected as coverings are reduced, and shortened. Secondly the performance of the engine will be altered in a manner that the car manufacturer had not intended. Usually testing is performed by the aftermarket manufacturer to ensure there are no problems, but with less reputable companies, this may not always be true. Finally, emissions standards as set by California Air Resources Board (CARB) are extremely strict and do not allow for the usage of performance air coolers that increase vehicle’s pollution. While air intakes can be approved by CARB, this is often not the case. As such cars fitted with an unapproved air intake, may fail vehicle inspections performed in areas with CARB emissions standards are in effect. Cold air intakes are able to improve both the performance and efficiency of your vehicle’s engine. Installation is fairly straightforward on most systems, not even requiring a garage visit. While the initial cost may be a bit steep for some, the gain in performance will be well worth it, and some costs can be recuperated through fuel savings. You may also be interested to know that the filters mentioned here are designed for the Toyota Tundra 5.7l gasoline engine, but they will also make the best cold air intake on a Toyota Sequoia, thanks to the similar design. You’ll also find that there have been few design changes between 2007 and 2017, meaning many of them will work on the entire range. 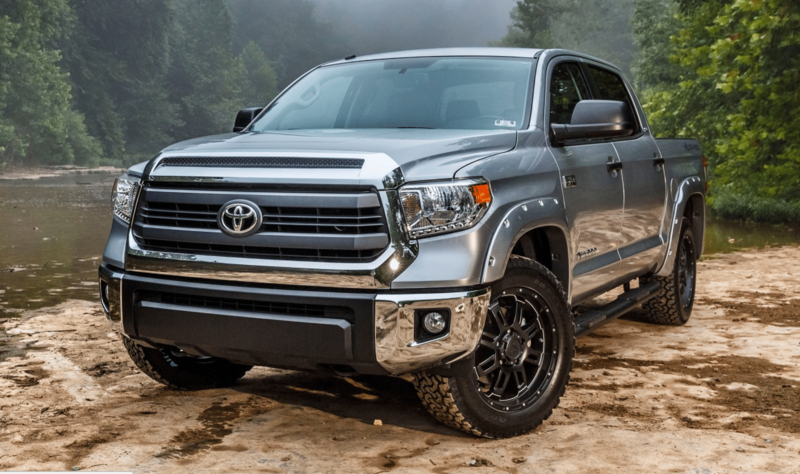 We hope that this list of the four best cold air intake systems for the Toyota Tundra has helped make your buying decision more informed.